Tipard PDF ePub Converter, the professional and accurate PDF to ePub Converter, can help you conveniently convert PDF to ePub format. While ePub format is a standard eBook format, which is widely supported by portable devices, such as Apple iPad; iPhone and iPod Touch, Sony Reader, Hanlin eReader, etc.This PDF ePub Converter can provides you with the best PDF to ePub converting experience, It will preserve the original texts, layout, images, etc. 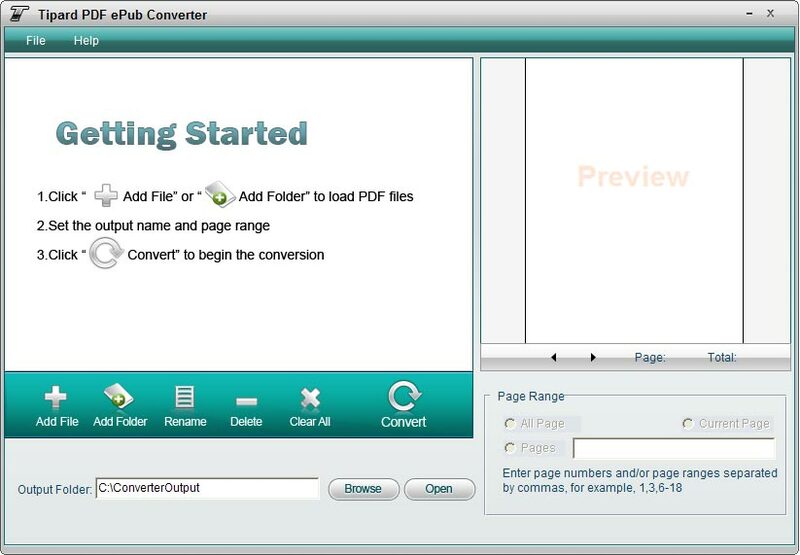 Tipard PDF ePub Converter, the professional and accurate PDF to ePub Converter. Tipard PDF ePub Converter supports nearly all languages of PDF files, including English, Turkish, Thai, Latin, Korean, Greek, Cyrillic, Arabic, Japanese, Chinese, etc. It possesses an intuitive interface, which will make the PDF to ePub converting operation much easily. With only a few mouse clicks, you can finish the PDF to ePub converting with the fewest time. Tipard PDF to ePub Converter provides you with powerful function of converting PDF to ePub format. This PDF ePub Converter also allows you to execute a batch file. Then you can get numerous ePub files with only one conversion. The outputted ePub file will exactly the same with the original PDF file. The original make-up, texts, images... will be kept intact. Qweas is providing links to Tipard PDF ePub Converter 3.2.38 as a courtesy, and makes no representations regarding Tipard PDF ePub Converter or any other applications or any information related thereto. Any questions, complaints or claims regarding this application Tipard PDF ePub Converter 3.2.38 must be directed to the appropriate software vendor. You may click the publisher link of Tipard PDF ePub Converter on the top of this page to get more details about the vendor.